This project has the aim to track elliptic targets moving in time. This can be used in the pharmaceutical industries: In order to test the potential of the medicament, it is necessary to analyze the direct effect on cells. Hence, the cells have to be tracked so that a morphological change can be traced. There are already many different cell tracking algorithms which are based on different methods. This project tries to use a different approach by using knowledge from the past and the future (As the movement of cells is usually registered as a film, it is possible to know the image that follows the actual one). Cells, as being living creatures move around and displace them self in their environment. Captured with a microscope, this movement can be visualized as a film, where the taken pictures are shown one after the other. Another possibility to illustrate the cell movement is to staple the images on top of each other in order to create a 2D+t image. The time dimension can be understood as an additional space axis. Figure 1 shows the whole image visualized as a 2D+t image. 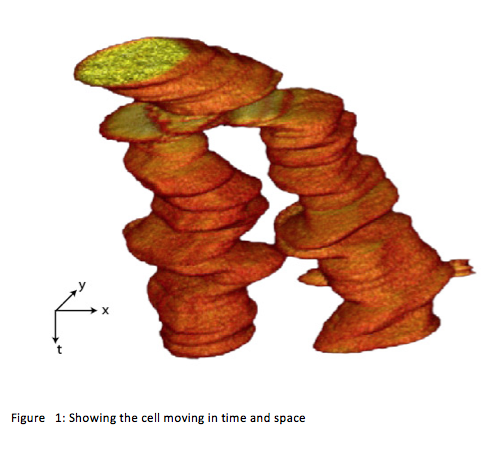 The cell shown in the picture forms a tube-like volume. The goal of this project is to build an artificial tube around the 3D cell shape in order to track its way. 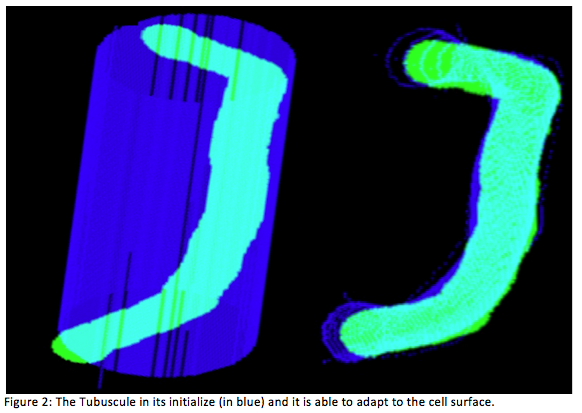 Having established this tube, the Tubuscule, it will be possible to classify the cells in the image as shown in Figure 2.